During the early 1880s, Reverend C.C. 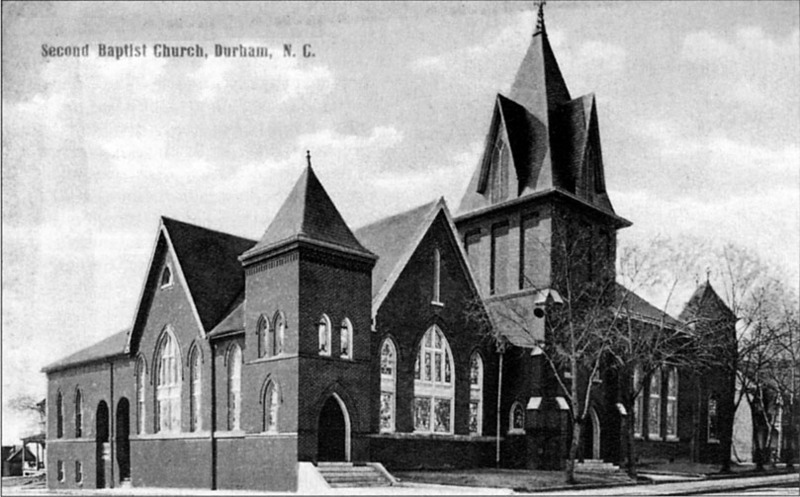 Durham of the First Baptist Church began a movement to establish Sunday schools in other parts of the city. One of these was located in the house of J.W. Blackwell at 602 South Duke St. J.W. was the brother of W.T. Blackwell, who lived nearby on West Chapel Hill St.
With the growth in population in the West End, the Blackwells and William Vickers donated land and money for the construction of a church at the southwest corner of West Chapel Hill St. and Shepherd St. 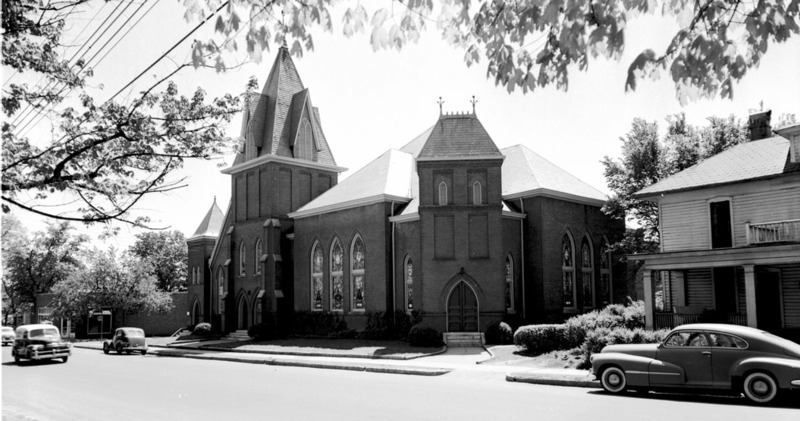 The church was formally organized and constructed as Blackwell Baptist Church in 1888. 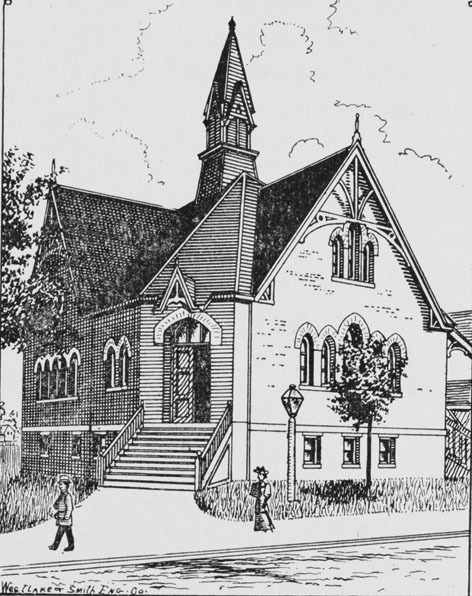 It was then renamed Second Baptist Church in 1890, and is pictured in the engraving above, circa 1895. During the time that WG Barrett was reverend of the church, during 1905-1911, the congregation had grown to the point that more space was necessary, and the original church building was expanded. In ~1918, the name was changed to Temple Baptist Church. Looking southwest from West Chapel Hill St., ~1910s. 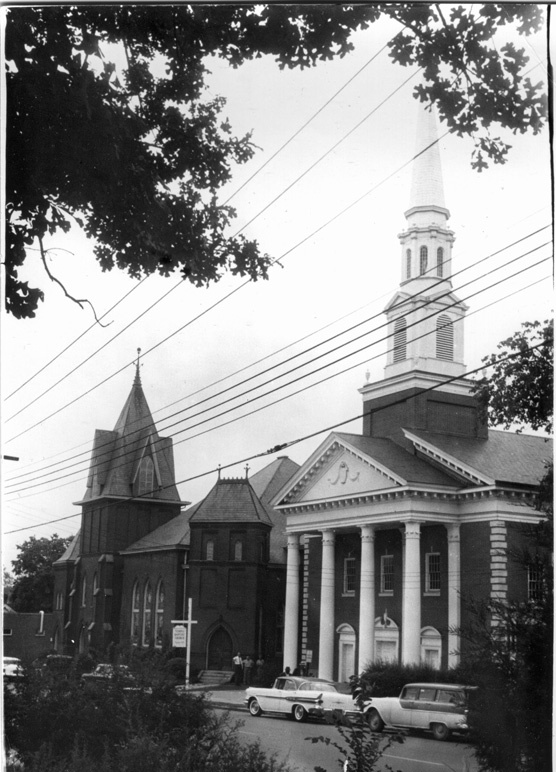 The original 1880s sanctuary and 1900s addition were still around in the mid 1950s. Looking southeast from near S. Buchanan and W. Chapel Hill. 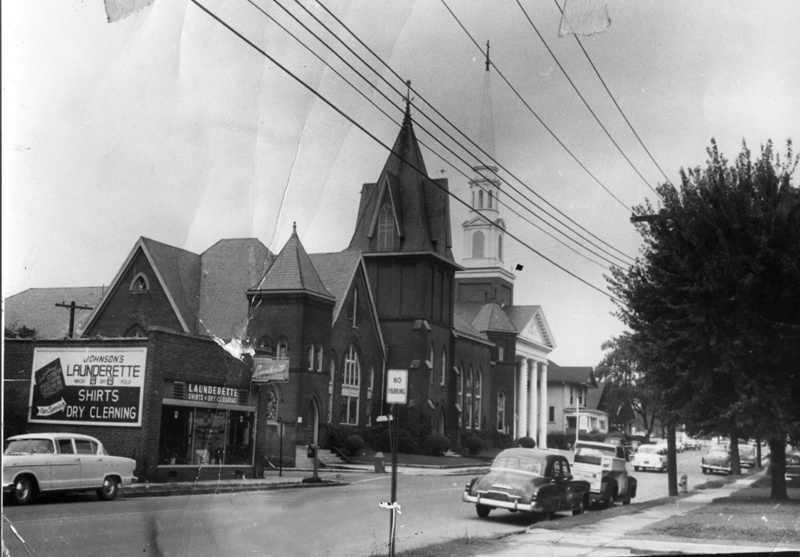 In 1957, the church built a new sanctuary on the site of the white frame house in the above picture. Looking southwest at old and new sanctuaries, 1959. Looking southeast at old and new sanctuaries, 1959. The church tore down the old sanctuary within a few years of completion of the new. The church congregation remained here until 2003, when they decamped for the suburbs. Healthy Start Academy, a charter school, bought the church buildings and continues to operate here. The site today. The original sanctuary 'came up to' the corner of Shepherd St. and West Chapel Hill, now only an intersection of sidewalks.